The progressive democratization of AI technologies in the recent past and the increased proliferation of messaging apps culminated in the creation of chatbots. This innovation has opened enormous opportunities for enterprises. Businesses are able to engage with customers almost 24/7 and offer enhanced experiences throughout their buyer's journey by providing almost instant resolution to customer queries. This enables organizations to build brand loyalty despite the constraints of human limitations. Little wonder then, that chatbots are being hailed as the future of customer service! Why Does Your Business Need AI Chatbots? Though chatbots have been around for some time, they have evolved significantly. From command--based chatbots which could answer limited questions and required manual help for complex ones, to AI chatbots that became smarter with time through machine learning, chatbots have witnessed an impressive change. Today, many businesses are getting real value out of them: global 5-star hotel chain Marriott and Coca-Cola are among the best examples. A survey conducted by a software giant discloses that nearly 80% of businesses are planning to have a chatbot by 2020 and business benefits of AI chatbots are tremendous. 2. Chatbots Offer Better Service on Mobile Devices: There is no doubt that the future of browsing is mobile; already the number of mobile users is higher than PC users. Using chatbots in mobile apps enables the creation of more streamlined user interfaces. It allows users to browse, evaluate, purchase, and get support from a single interface. 3. You Can Scale Up Your Operations: Human beings have their limitations; an agent may be able to engage with a maximum of 3 customers at a time, whereas AI-based chatbots have no such limits. 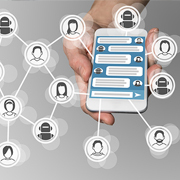 By fortifying your workforce with chatbots, you can interact with more users, helping you increase your customer base and even enter new markets. 4. Divert Human Resources to Core Tasks: By deploying AI-based chatbots you can divert precious human resources to more important tasks. Bots allow humans to handle customer queries only if they are very complicated, and human intervention becomes extremely necessary. In fact, you can set your chatbots to screen calls, so that simpler queries or issues are resolved by the bot. Over time, the chatbot can become smarter through machine learning, and may hand off fewer queries to human agents. 5. Smart Messaging Provides More Value to Customers: Your chatbot can be used to deliver smart messages to your customers - combining big data, personalization, and machine learning. This is especially useful in financial institutions. Let's suppose there is a credit card transaction in Shanghai for a user whose address is Pasadena, California. The chatbot can pop up and ask - I noticed a big charge made to your card this afternoon in China. Are you travelling? If it's not made by the customer, they can instantly inform the card company. Similarly, the chatbot can warn the customer about overdraft fees, or overdue bills - it's less intrusive for the customer, and easier for them to make the payments as they are already on that site. 6. Assist Customers in Making the Right Choice: Do you sell goods and services that are almost substitute of each other? Are you selling higher-end goods or gadgets? Here too, a chatbot can provide invaluable service. Choosing can become very difficult when the choices are very close, or the customer has to shell out big bucks. Chat bots can easily guide the customer and help them get the right product or service. 7. Upselling and Recouping Carts: Customers who have completed a purchase are more likely to purchase again. Chatbots can interact with these customers and leverage the opportunity of upselling to them. Cart abandonment rate is high in e-commerce; email marketing has been marginally successful in getting people to go back to their carts and complete purchases. However, chatbots are capable of doing this job even better. 8. Increased Personalization: Chatbots allow you to categorize your audience and provide different persons a customized experience. It's human nature that we feel pleased when we are recognized, and our preferences are remembered - just as when you walk into a restaurant and the waiter asks you ‘Your usual table? Chatbots can recommend products to you based on your purchase history. This is especially helpful when the product is something the customer would need to buy repeatedly - say pet food, or kitchen towels. 9. Tap into the Millennials Segment: Millennials prefer to chat rather than talk over phone; they also like to ask around and compare dozens of products before they make a final decision. A chatbot will do this task efficiently; introducing chatbots can therefore help you to get millennials to purchase from you. 10. Leverage the benefits of Interactive Marketing: Chatbots represent an active user experience, unlike websites and apps, which are passive. Not only can you use them for interactive marketing, you can reach out to a larger audience; in fact, several people simultaneously. Using chatbots can also simplify several tasks for you when you use online channels like your social media networks to engage with customers. What is in it for the Customers? Chatbots are not only business-friendly, but, extremely useful from the customer's point of view as well. Bots provide customers real-time information and round-the-clock resolution to their queries. They can interact directly with big brands, buy products, order food, get information or real time news, and even build schedules. The biggest advantage for users is that they don't have to download or sign into it - they are transient, and customers can use them on their terms and when they want to. Outsource2india is an ISO-certified company that has been providing top-notch software development services to businesses globally for nearly two decades. Our team of dedicated professionals ensures that they stay on top of technological innovations and the latest software trends, so that they can provide exemplary digital solutions to organizations regardless of the domain, size, or geographic location. Our highly-trained and experienced developers are adept at understanding customers' business processes and providing tailor-made solutions that help them achieve business goals. We understand the application of chatbots in business and you can be assured of high quality, cost-effective services. Our team can develop a chatbot that personifies your brand, and helps you in brand building, providing customer delight, and eventually driving growth. View our portfolio. Do get in touch with us to enquire about creating AI-based chatbots for your business - we'll get back to you with a quote within 24 hours.